The City of Milpitas Engineering Department and Milpitas Sanitation are dedicated to helping your business maintain disposal reduction goals and provide quality solid waste services. Please call Milpitas Sanitation Customer Services at (408) 988-4500 Monday – Friday, 8 a.m. to 6 p.m., to establish or improve you recycling and garbage collection services. Milpitas Sanitation will assist you with recycling bin or cart delivery and related issues such as overloaded bins and organics recycling. The City of Milpitas requires a minimum garbage collection schedule of once a week. If you have questions about service frequencies or the Solid Waste Management Ordinance, please call (408) 586-3352. Please visit Milpitas Sanitation for information about new collection bins for Recyclables, Yard Trimmings, Garbage and Food Scraps. Click here to view commercial recycling and solid waste collection rates. Starting July 1, 2018 – No Styrofoam Food Containers! Restaurants must use alternatives for both dine-in and takeout. Milpitas Ordinance No. 293 prohibiting the use of foam food ware goes into effect on July 1, 2018. It requires all restaurants and other food establishments to use alternatives for foam food ware for both dine-in and takeout. Restaurants owners and managers may choose the best alternative for their business needs. Click here for a reference guide of non-foam food container product information and material listing, provided courtesy of the City of san Jose. Ordinance No. 293 aims to reduce litter by banning food service ware made from expanded polystyrene (EPS) foam, commonly referred to as Styrofoam. EPS foam is uniquely problematic when littered because it does not degrade. It breaks easily into tiny pieces, making it difficult to clean up. Those small pieces are often mistaken as food by fish and wildlife and are harmful to their health. California Assembly Bill 341 — effective since January 1, 2012 — requires all businesses that generate at least 4-cubic yards or more of garbage per week participate in a recycling program. Call Milpitas Sanitation Customer Service at (408) 988-4500 to learn more about commercial recycling and garbage services. Is My Business Required to Recycling? Yes, if your trash bin is 4 cubic yards or bigger, or if you have smaller bin that is serviced 2-3 times per week, you need to start recycling services. With the right training, recycling can be easy! Since all recyclables can be placed in just one container, there’s no need to spend precious time separating. Just follow these guidelines to make your program a success. Depending on the amount of trash and recyclables your business generates, you may find that your onsite containers aren’t large enough to accommodate your disposal needs. If your containers are over loaded (i.e., you can’t close the container lids), then it’s time to contact Milpitas Sanitation at (408) 988-4500 to schedule a free waste consultation. Properly disposing of hazardous waste can be costly and inconvenient. Fortunately, small business owners in Milpitas have a cost-effective and environmentally sound option to meet their hazardous waste recycling and disposal needs. If your business qualifies as a Conditionally Exempt Small Quantity Generator (CESQG), you have the opportunity to participate in the Santa Clara County CESQG Program. To qualify, you must generate less than 220 lbs., or 27 gallons of hazardous waste per month, or less than 2.2 lbs. of Extremely Hazardous Waste per month. Click here to learn how to participate. If your business does not qualify for the CESQG Program, please refer to the County’s Hazardous Materials Compliance Division for detailed information on how to properly handle your business’ hazardous waste. The ability to identify what items belong in which containers is essential to the success of the recycling process. Even more vital to our efforts is keeping hazardous waste out of both the trash and recycling streams to protect workers and the environment. Keep your work area clean and prevent water pollution! You can do this by: maintaining clean enclosures; keeping bin lids closed at all times; increasing service if bins always overfill; watching for leaks from bins and call Republic when this happens. Is My Business Required to Recycle Organics? April 1, 2016: Businesses that generate 8 cubic yards of organic waste per week shall arrange for organics waste recycling services. January 1, 2017: Businesses that generate 4 cubic yards of organic waste per week shall arrange for organics waste recycling services. January 1, 2019: Businesses that generate 4 cubic yards or more of commercial solid waste per week shall arrange for organics waste recycling services. How Can I Start Organics Recycling? 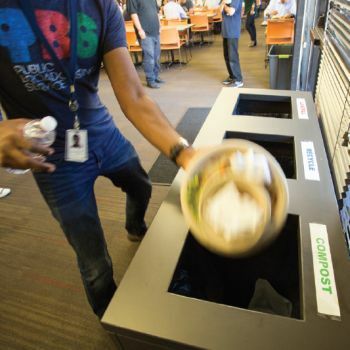 The City of Milpitas and Milpitas Sanitation offer food waste recycling and a recycling coordinator to help make this transition as easy as possible. Please contact Milpitas Sanitation Customer Service at (408) 988-4500 to set up or get help managing your organics recycling program. You can also visit Milpitas Sanitation for more information. Forty percent (40%) of the material going to landfills is compostable! Compost builds healthy soils through the introduction of organic matter, prevents soil erosion, reduces the need for chemical fertilizers and pesticides, and significantly increases water retention. The CO2 released during the decomposition of composting is a natural part of the carbon cycle, whereas the CO2 releases in an anaerobic environment (such as a landfill) releases the carbon as a methane, which is a significantly more potent greenhouse gas in the short term. License plate number, if this can be safely obtained. To report suspicious discharges into the storm drain, call 9-1-1 immediately. The City of Milpitas Fire Department responds to reports about illegal dumping into storm drains. Remember: Anything other than rain water is an illegal discharge to our storm water conveyance system, our creeks and South San Francisco Bay. If hazardous waste has been dumped on your business property, please email the County of Santa Clara’s Household Hazardous Waste Program to ask for suggestions pertaining to illegal dumping prevention and tips. 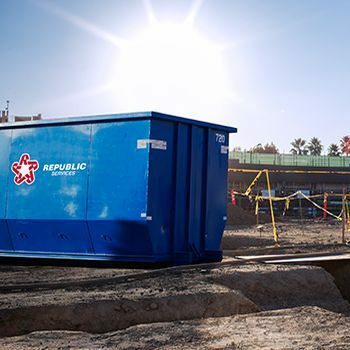 Get details on obtaining a temporary debris box for your commercial improvement project. 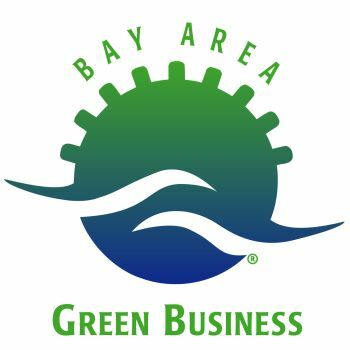 Learn about the advantages of being certified as a Bay Area Green Business and get certified today! Find general tips on how you can prevent waste in your workplace! 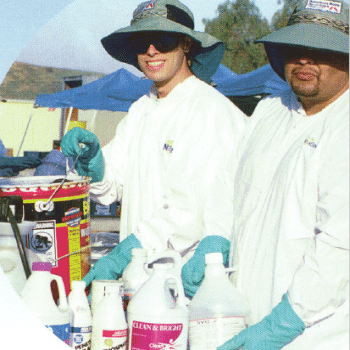 Find out how to participate in the County's hazardous waste recycling program.